Well I guess it's time I started my BAP thread. I bought my bike last September and have been working on getting it running right. I just wanted to ride it for awhile before really tearing into it. I got it pretty well sorted out and threw some clubmans on it so it didn't look so dorky. I planned on tearing it down this winter or next to do it right. However, a few weeks ago I accidentally bent an exhaust valve while replacing the points housing gasket (I don't really want to get into how stupid that was). To replace the valve, I have to take the engine out. Since I have the engine out I might as well paint the frame. While I have everything off the frame, I might as well do everything else. So it begins. I spent a few nights taking stuff off of the bike and managed to get the engine out of the frame by myself (not easy). I made a little engine stand out of some scrap wood to keep it from wobbling around while I worked on it. I then took most of the other stuff off of the bike. I still need to remove all of the electrics. I'd like to take this thing full cafe. Probably clipons and short shocks - I'd like to lower her a bit. I've got short legs and I am currently on my tip toes. Relocate all the electrics to an underseat tray. I'm not sure about the pipes. I will either keep the stock ones or make some that look like Troybilt's. The color scheme will be satin black with brushed metal highlights. I'm thinking kind of like this but more brushed metal. Wheel hubs and spokes will be brushed metal and the rims will be black. Going to try and incorporate the stock tail light into a custom mount on the back of the seat. If it doesn't look right, I'll get a new one. I'm not sure what the seat will look like yet, but a friend of my dad builds hot rods and is pretty good with aluminum. If I can get the battery hidden under the seat, I'll throw some velocity stacks on there instead of those cheap pods. Anybody emulating Exiles colors has my vote. Let me know if you find a way to get that nice brushed look on your alum bits. I've been chasing that tiger for a while now, but just can't nail it down. they are damn sick and rather hard to come by nowadays! Looking forward to seeing where this goes. I have a '72 CL450 that I want to go all the way with as soon as I finish the R5 i'm working on. I haven't done any aluminum yet, so we will see. I think, like DrJ, I will be using scotchbrite pads. When I was polishing my aluminum, the SB pad was an intermediate step and I rather liked the finish it left. I think the key is to always rub/sand in the same direction. I did one of my gauges the other night and it turned out well. They are steel so I used 220 grit sandpaper and then some medium steel wool. All the bare/brushed metal will be clearcoated. So far I have been using Rustoleum High Heat Clear Enamel. 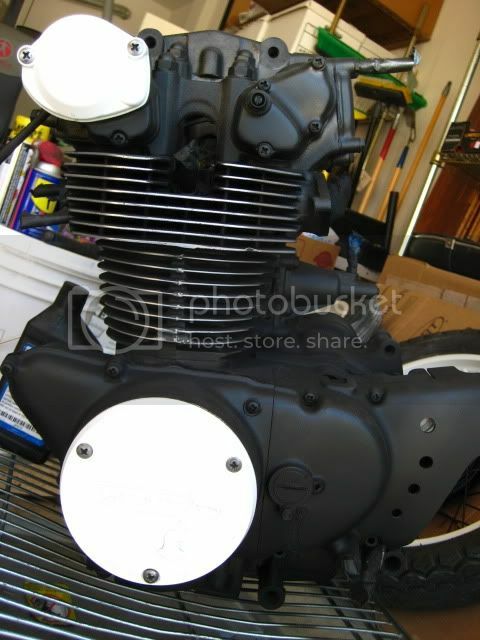 I like the way Goodfornothing's engine turned out and will be doing mine like his, but the covers will be brushed instead of white and I think I am going to brush all of the cam covers and maybe the valve covers. Also going to get a stainless bolt set. When you use the SB pads are you just rubbing those on the bare metal? Or are you using a polish of some kind? Mother's or something?